There are many ways to contribute to OpenBoxes, and not just through making changes to the source code. Here are a few examples of areas we need a considerable amount of help. 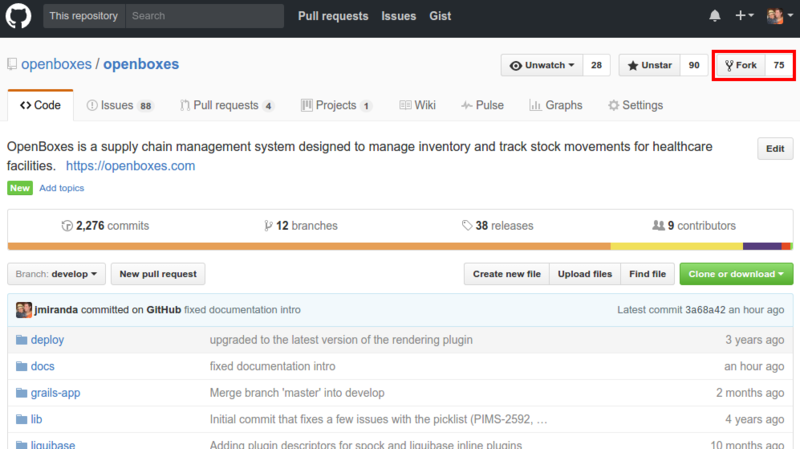 Find or create an issue for the feature or bug in GitHub Issues. Fork the openboxes/openboxes GitHub repository. Create a branch for your changes (create a hotfix for bugs if working off master or a feature branch for features if working off develop). NOTE: The use of the hotfix or develop prefix will help us identify which branch we need to merge your changes into. Implement your feature or hotfix in your new branch. Write a test for your changes (if you have trouble with this step please comment in your ticket that you'd like some help). NOTE: Tests are required for features and bug fixes, but not for documentation and translation changes. git commit -m "Implemented feature #123"